Resveratrol is an antimicrobial agent, produced by certain plants in response to pathogens [1,2]. The polyphenol is most abundant in peanuts, red wine and the skin of grapes. This has lead to much research into potential health benefits of red wine, though the adequacy of resveratrol content for bioactivity is debatable. The polyphenol has been attributed with a variety of health promoting activities including cancer prevention, antioxidant and anti-inflammatory activity, cardioprotective effects and airway dilation [3,4], most of which have been reported in rodents. Due to its ability to inhibit arachidonic acid release and production of lipoxygenase and cyclooxygenase products [5-7], resveratrol may also have beneficial effects on allergic inflammatory responses. Mast cells are key mediators of allergic and anaphylactic responses, releasing pro-inflammatory mediators in response to allergen-crosslinking of FcεRI-bound IgE [8,9]. Resveratrol reduces airway hyperresponsiveness, inflammation and allergen specific IgE levels in vivo in an OVA-induced mouse asthma model . Preliminary in vitro animal studies report resveratrol-induced inhibition of degranulation and histamine release in mouse bone marrow mast cells (BMMC) , rat basophil-like cells (RBL-2H3) [12,13], and rat peritoneal mast cells , likely by suppressing tyrosine phosphorylation of ERK and PLC 1 . Furthermore, mouse BMMC cysteinyl leukotriene, prostaglandin D2, and TNF production are reduced by resveratrol . Studies examining the effects of resveratrol on human mast cells are lacking. Thus, the purpose of this study was to determine the effect of resveratrol on key aspects of human mast cell activation to physiological stimuli, including degranulation and inflammatory mediator release. To this effect, we utilized CD34+ cell-derived human primary mast cells (HuMC) and LAD2 mast cells. Furthermore, we compared the effects of resveratrol to an existing anti-allergy medication, tranilast. LAD2 cells were cultured in serum free media (StemPro-34 SFM, Life Technologies, Burlington, ON) supplemented with 2 mM L-glutamine, 100 U/ml penicillin, 50 µg/ml streptomycin and 100 ng/ml stem cell factor (Peprotech Inc., Rocky Hill, NJ). The LAD2 cells were periodically tested for expression of kit and FcεRI by flow cytometry and the expression of these receptors was equal to that of blood derived CD34+ cells. Human peripheral blood-derived CD34+ cells were cultured in StemPro-34 SFM supplemented with 2 mM L-glutamine, 50 µg/ml streptomycin, 100 IU/ml penicillin, 100 ng/ml SCF, and 100 ng/ml recombinant human IL-6 and recombinant human IL-3 (PeproTech) (30 ng/ml; first week only). At 8 - 10 weeks, cultures consisted of greater than 99% HuMC, and stained metachromatically with toluidine blue. For experiments requiring overnight incubation, both LAD2 and HuMC were cultured in serum free media (StemPro-34 SFM) supplemented with 2 mM L-glutamine, 100 U/ml penicillin, 50 µg/ml streptomycin and 100 ng/ml SCF. Cells were suspended in buffer and stimulated with 0.5 μg/ml substance P or 0.3 μg/ml compound 48/80 (SigmaAldrich Canada, Oakville, ON) for 30 min at 37˚C/5% CO2. For IgE assays, cells were sensitized overnight at 37˚C/5% CO2 with 0.5 μg/mL myeloma IgE (Calbiochem, Billerica, MA), followed by 30 min stimulation with 100 μg/ml rabbit anti-IgE (Dako, Carpinteria, CA) or overnight with 0.1 μg/ml IgE-biotin (Abbiotec, San Diego, CA) and 30 minutes with 0.5 μg/ml streptavidin. Cells were pretreated with tranilast and/or resveratrol (Sigma-Aldrich) for the indicated times prior to agonist stimulation. β-hexosaminidase levels in the supernatants and cell lysates were quantified by hydrolysis of substrate p-nitrophenyl N-acetyl-β-D-glucosamide (SigmaAldrich) in 0.1 M sodium citrate buffer (pH 4.5) for 90 min at 37˚C. The percentage of β-hexosaminidase release was calculated as percent of total content. Cells were loaded with 1 μM fura-2 AM (Invitrogen, USA) in HEPES buffer for 30 min at 37˚C, followed by washing and 15 min incubation in BSA free Hepes at 37˚C. Cells were placed in a poly-D lysine coated glass bottom dish under an inverted fluorescent microscope (Axiovert 200, Carl Zeiss Canada Ltd.) and excited at 340 and 380 nm using a high speed filter changer. Fluorescence measurements were performed and calcium responses were recorded at 100 msec intervals using SlideBook for Stallion, version 4.26.04 software (Intelligent Imaging Innovations, USA). Resveratrol, tranilast (10 μg/ml), and substance P (0.5 ug/ml) were added after establishing basal calcium signal. Calcium responses of 20 randomly selected cells were analyzed for each condition (and repeated for n = 3) and were plotted as 340/380 ratio vs time. Cells were pretreated with resveratrol and/or tranilast for 3 hrs at 37˚C/5% CO2 followed by 20 hrs stimulation with 0.5 μg/ml substance P. Cell free supernatants were isolated by centrifugation and analyzed for human cytokine expression using commercial TNF and MCP-1 ELISA kits (eBiosciences, San Diego, CA). Cells were sensitized overnight with 0.5 μg/ml IgE, prior to treatment with resveratrol or tranilast for 3 hrs at 37˚C/5% CO2. Cells were subsequently stimulated with 100 μg/ml anti-IgE. Cell free supernatants were isolated by centrifugation and cysteinyl leukotriene (cysLT) levels were measured using commercial competitive enzyme immunoassays (Assay Designs). Cells were treated with 10 μg/ml resveratrol, tranilast or 10 μM forskolin for 30 min, then the reaction was stopped with the addition of 5 M HCL for 20 min followed by trituration with a pipette. Cell free supernatants were isolated by centrifugation and cAMP was measured using a commercial competitive immunoassay (Cayman Chemicals, Ann Arbor, MI). Cells were pretreated with resveratrol or tranilast for 3 hrs followed by 3 hrs stimulation with 0.5 μg/ml Substance P (37˚C/5% CO2). Total RNA was isolated from each treatment using Tri Reagent method (Sigma-Aldrich Canada, Oakville, ON). cDNA was synthesized by reverse transcription of 1μg total cellular RNA using oligo dT primer (IDT; Integrated DNA Technologies) and M-MLV reverse transcriptase enzyme (Invitrogen, Burlington ON). Gene expression was analyzed using quantitative PCR on a Step One Plus system (Applied Biosystems, Foster City, CA). Twenty ng of cDNA was used in each quantitative PCR assay, and all reactions were performed in duplicate for 40 cycles. Primer sets were designed using Primer Express software (Applied Biosystems). TaqMan probes, IDT primers (Integrated DNA Technologies) and Gene Expression Master Mix (Invitrogen; Burlington, ON) were utilized (Table 1). All data were normalized to GAPDH internal controls and reported as fold change in expression over untreated control cells. Cells were treated with resveratrol or tranilast for 20 hrs at 37˚C/5% CO2, washed and resuspended in 0.1% BSA/PBS and placed on ice for 10 min. Cells were subsequently incubated with PE-conjugated anti-FcεRI antibody or isotype control antibody (eBiosciences, San Diego, CA) for 1 hr, at 4˚C. Cells were washed twice with 0.1% BSA/PBS, resuspended in the same buffer and analyzed on a FACSArray flow cytometer (BD Biosciences, Mississauga, ON). FcεRI levels are expressed as mean fluorescence intensity (MFI). Results were expressed as means ± standard errors. Data were analyzed by Student’s t test or one-way ANOVA. b-hexosaminidase release was measured in quadruplicate for each experimental condition, with each experiment performed at least 3 times, and data analyzed by repeated measures ANOVA with Tukey Post Hoc test. IC50 values were determined by non-linear regression, 4-parametric analysis using GraphPad Prism software (GraphPad Software Inc, San Diego, CA). All data were corrected for vehicle (DMSO) effects and significance was defined as a P value of less than 0.05. To determine the effect of resveratrol and tranilast on human mast cell degranulation, LAD2 cells were pretreated with different concentrations of the two compounds for 30 min prior to stimulation with either substance P (0.5 μg/ml), compound 48/80 (0.3 μg/ml) or IgE/anti-IgE (0.5 μg/ml/100 ng/ml) (Figure 1). Both resveratrol and tranilast (100 μg/ml), inhibited degranulation induced by substance P (68% and 52%, respectively), compound 48/80 (80% and 51%), and IgE/anti-IgE (37% and 27%, respectively). To determine the optimal inhibitory effects of resveratrol, several treatment times were tested. LAD2 cells were pretreated with resveratrol for 0 min (i.e. same time as stimulant), 30 min, 3 hrs, and 24 hrs prior to activation with 0.5 μg/ml substance P, 0.3 μg/ml compound 48/80, or 0.5 μg/ml streptavidin (in 0.1 μg/ml IgE-biotin sensitized cells). 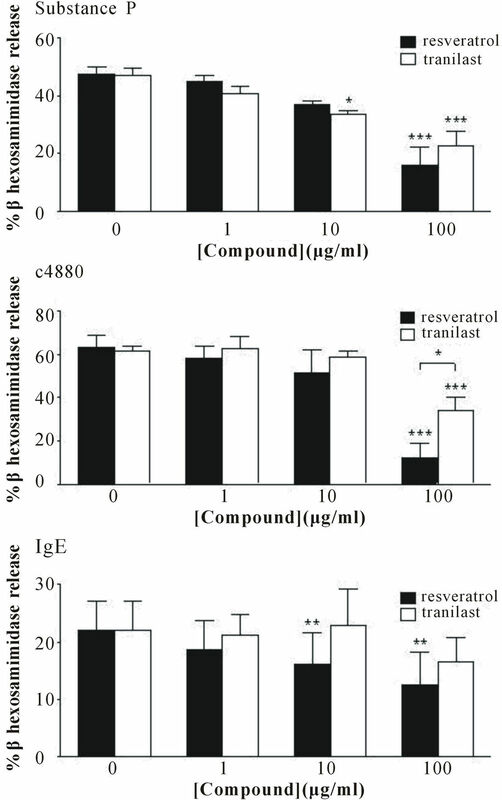 Resveratrol significantly inhibited substance P and IgE mediated human mast cell degranulation at all time points tested (Figures 2(a) and (c), respectively). Resveratrol also inhibited compound 48/80-induced degranulation, though it was less effective at earlier time points, requiring higher concentrations to inhibit responses (Figure 2(b)). IC50 values calculated from concentration response curves as in Figure 2(d) ranged from 1.34 to 12.5 ug/ml depending on the stimulant utilized and the duration of resveratrol treatment. As degranulation is calcium dependent, we examined the effects of 10 μg/ml resveratrol and tranilast on intracellular calcium levels when added simultaneously with the stimulant substance P. Resveratrol, and to a lesser extent tranilast, attenuated substance P-dependent increases in intracellular calcium in LAD2 cells by 98% ± 15% and 45% ± 36%, respectively (Figures 3(a) and (b)). As increasing cAMP can inhibit mast cell degranulation, we examined the effects of resveratrol andtranilast on cAMP production in LAD2 cells, in comparison to the adenylate cyclase activator, forskolin. Neither compound, at 10 μg/ml had any effect on cAMP production, whereas cAMP levels double with addition of 10 μM forskolin (Figure 3(c)). Table 1. Sequences of oligonucleotides used for real time PCR. Figure 1. Inhibition of LAD2 degranulation. Substance P (n = 6), compound 48/80 (n = 3) and IgE/anti-IgE (n = 4) induced degranulation (% beta hexosaminidase released) was attenuated by resveratrol and tranilast. Data are expressed as mean ± SEM, *p < 0.05, **p < 0.01, ***p < 0.001. Figure 2. Resveratrol effects on degranulation are time dependent. LAD2 cells were pretreated with resveratrol for the indicated times, stimulated with (a) substance P; (b) compound 48/80 or (c) IgE-biotin/streptavidin and degranulation (%β hexosaminidase release) was measured (n = 3 - 6); (d) Concentration response curve for LAD2 stimulated with substance P, with resveratrol added simultaneously. Data are expressed as mean ± SEM, *p < 0.05, **p < 0.01, ***p < 0.001. Figure 3. Effect on calcium flux and cAMP production in LAD2 cells. 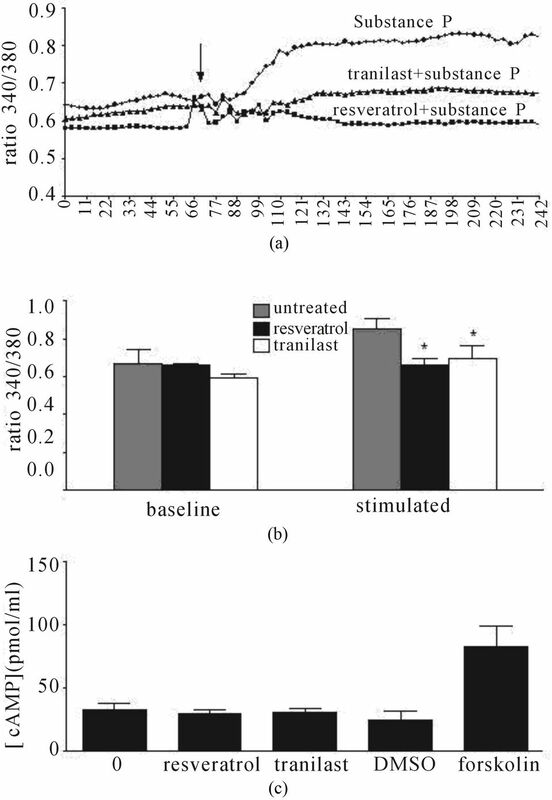 (a) Representative trace curve; (b) mean ± SEM (*p < 0.05) of data from n = 3 independent experiments showing resveratrol and tranilast inhibited substance P-dependent increases in intracellular calcium. Addition of drugs is indicated by the arrow on the trace curve; (c) Resveratrol and tranilast had no effect on cAMP production, n = 3.
whereas MCP-1 mRNA expression was entirely prevented with 100 μg/ml resveratrol (Figure 4(d)). Tranilast had no significant effect on MCP-1 production or expression, and the two compounds combined had no additional effect. Following 3 hrs pretreatment, 10 μg/ml resveratrol partially attenuated anti-IgE mediated production of cysteinyl leukotrienes in IgE sensitized LAD2 cells by 27% ± 14% compared to control, though this was not statisticcally significant. Tranilast had no effect on IgE-mediated response and the two compounds combined had no additional effect (Figure 4(e)). IgE mediates mast cell activation via its high affinity receptor, FcεRI. Thus we investigated the effects of resveratrol and tranilast on LAD2 cell FcεRI expression after 20 hrs treatment. While both compounds significantly reduced FcεRI expression at 100 μg/ml, resveratrol was more efficacious, reducing baseline FcεRI expression by 28% ± 0.4%, compared to 14% ± 2% by tranilast (Figure 4(f)). Lastly, we examined the effects of resveratrol and tranilast on primary human mast cells, HuMC. The effects of resveratrol were more marked in HuMC compared to LAD2 cells. Thirty minute pretreatment with resveratrol significantly attenuated IgE/anti-IgE-induced degranulation of HuMCs, resulting in 62% ± 7% inhibition at 10 μg/ml. In contrast to LAD2 cells, tranilast had no significant inhibitory effect on HuMC degranulation (Figure 5(a)). Similarly, 3 hrs pretreatment with 10 μg/ml resveratrol nearly abolished IgE/anti-IgE-induced cysteinyl leukotriene production by 90% ± 1% (Figure 5(b)). As with LAD2, tranilast had no effect on cysteinyl leukotriene production. 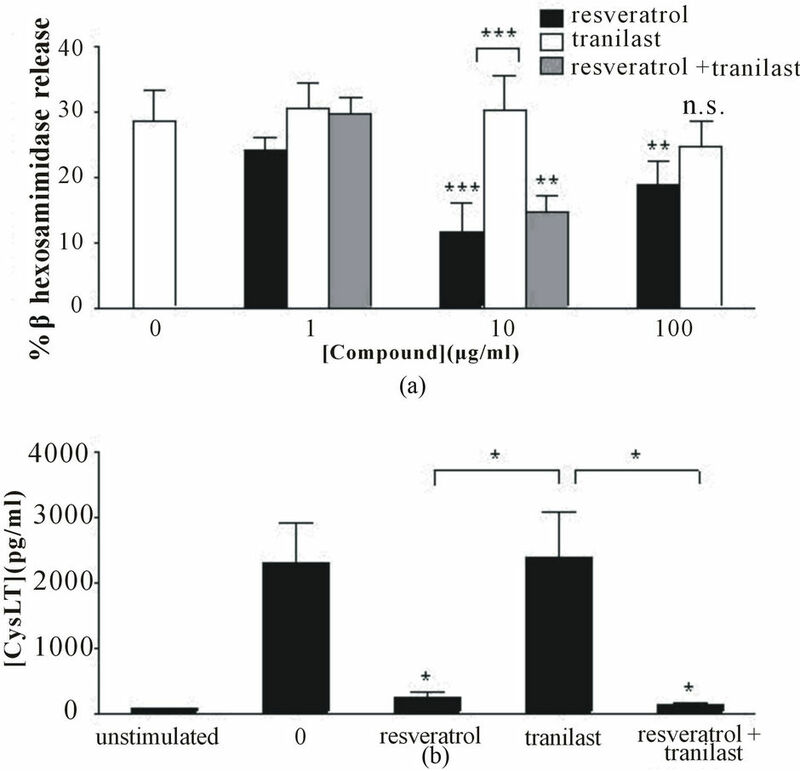 Resveratrol and tranilast combined had no additional effect. Mast cells are the key mediators of allergic inflammation and anaphylactic responses, releasing histamine, proteases, arachidonic acid metabolites and proinflammatory cytokines and chemokines in response to numerous stimuli. These ubiquitous cells are distributed throughout vascularized tissue, particularly at locales of pathogen entry, and can be activated by neuropeptides, such as substance P, complement proteins, bacterial, viral and parasitic components and antigen-crosslinking of IgE bound to its high affinity receptor FcεRI [8,9]. Figure 4. Inhibition of inflammatory mediator release and LAD2 mast cell function. Resveratrol inhibited substance P-induced (a) TNF production (n = 4); (b) TNF mRNA expression (n = 3); (c) MCP-1 production (n = 4); and (d) MCP-1 mRNA expression (n = 6), whereas tranilast had no effect; (e) Resveratrol (10 μg/ml) partially inhibited IgE/anti-IgE-induced cysteinyl leukotriene (cysLT) production (n = 3) and (f) reduced FcεRI expression (n = 3). Data are expressed as the mean ± SEM (*p < 0.5). resveratrol on degranulation and release of cysteinyl leukotrienes were more marked in human primary mast cells (HuMC), and the polyphenol was significantly more efficacious than the commercially available anti-allergy drug, tranilast, in both cell types. Resveratrol has limited bioavailability, being metabolized within 30 min following IV administration, and 2 - 4 hrs following oral administration in humans [16,17]. Given the short half life of the compound, effects on mast cell activation would have to be rapid. As we show here, resveratrol inhibition is immediate, preventing degranulation and calcium influx when added simultaneously to physiological stimuli, and the effect is sustained for up to 24 hrs. Longer duration of treatments (3 hrs) with resveratrol were required to inhibit slower aspects of mast cell activation, including de novo synthesis of inflammatory mediators, though this would still potentially be within range of the compound’s bioavailability. Thus assuming adequate concentrations are ingested, resveratrol could potentially inhibit mast cell activation and reduce allergic inflammation. Furthermore, resveratrol metabolites, which are more stable and have greater bioavailability (half life of 7 - 14 hrs in serum) than their parent compound, may also be biologically active [3,16]. Figure 5. Inhibition of HuMC activation. 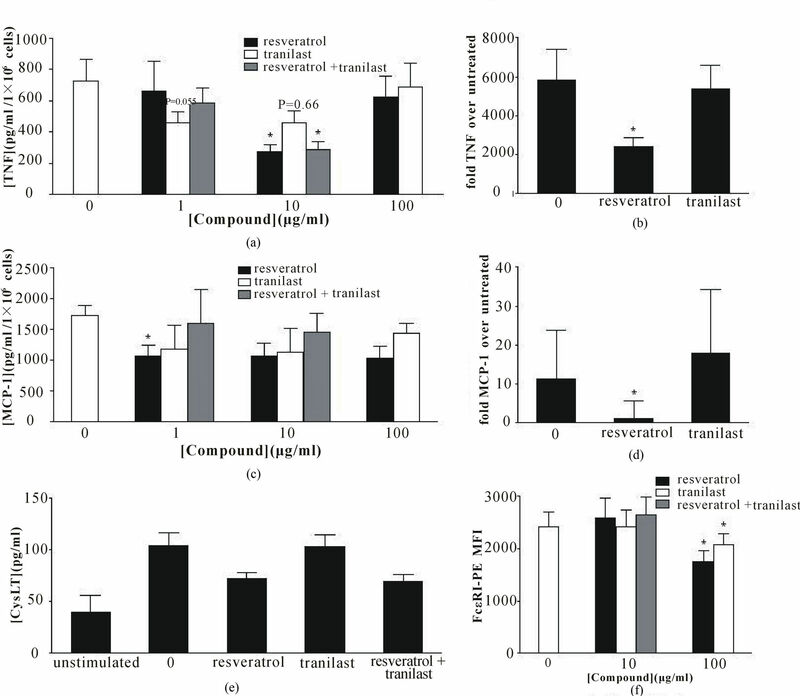 (a) IgE/anti-IgE-induced degranulation was attenuated by resveratrol, whereas tranilast was ineffective; (b) Resveratrol prevented release of cysteinyl leukotrienes by IgE/anti-IgE, in contrast to tranilast, which had no effect on arachidonic acid metabolite release. Data are expressed as mean ± SEM (*p < 0.05, **p < 0.01, ***p < 0.001, n.s. = not significant). vent interaction with the cell. However, the significant structural differences of the three stimuli (one a small peptide, one a large immunoglobulin protein and one a chemical compound) makes this unlikely. Furthermore, if prevention of stimuli-cell interactions was occurring, one would expect that all mast cell responses would be equally affected. This was not the case, as resveratrol had no significant effect on IgE-mediated cysteinyl leukotriene production, whereas IgE-mediated degranulation was reduced by as much as 81%. Additionally, resveratrol was differentially potent with respect to inhibition of TNF and MCP-1 expression, and required much longer treatment times (3 hrs) to have any effect on cytokine responses, as compared to degranulation. A more likely mode of action of resveratrol is via inhibition of calcium signaling. Critical to mast cell degranulation is the rise in cytosolic calcium levels following cellular activation [18,19]. We found that 10 μg/ml resveratrol effectively abolished calcium flux when added simultaneously with substance P. This concentration of resveratrol gave 53% inhibition of degranulation under the same experimental conditions, thus calcium modulation only partially accounts for the effects of resveratrol on degranulation. The rapidity of this response suggests that resveratrol is directly inhibiting calcium flux, possibly by direct inhibition of calcium channel activation. Kang et al. similarly demonstrated partial reduction in PMA/calcium ionophor-induced calcium flux in HMC-1 mast cells, though they did not correlate this to degranulation responses . Modulation of cyclic nucleotides can also impact degranulation, as cAMP analogues , cAMP phosphodiesterase inhibitors , and the AC cyclase activator forskolin [22,23] inhibit mast cell degranulation, as do cAMP elevating agents, such as PGE2 , methanandamide  and β2 adrenergic agonists . We did not, however, observe any increase in cAMP levels following resveratrol treatment, thus cAMP is not responsible for the inhibitory effects of the polyphenol. Inhibition of MCP-1 and TNF expression observed in this study may be attributable to resveratrol modulation of transcription factor activation. In fact, resveratrol is reported to reduce activation and nuclear translocation of the transcription factor NF-κB in a number of cell types [15,25,26]. Furthermore, resveratrol inhibits AP-1 transcription factor activation in U-937 histiocytic lymphoma cells . This inhibition is likely mediated upstream of the transcription factors, as resveratrol prevents activation of IκB kinase and subsequent IκB phosphorylation in THP-1 monocytes , though not in U-937 histiocytic lymphoma cells . Additionally, Kang et al. reported reduction in ERK activation and IκB degradation in HMC-1 cells which may have contributed to reduced TNF, IL-6 and IL-8 expression in these cells . In conclusion, our data shows that resveratrol inhibits the major aspects of mast cell activation, partially by attenuating calcium flux, and that these effects occurred within the time range of reported bioavailability. Furthermore, resveratrol was a more effective inhibitor of mast cell activation than the commercially available antiallergy drug, tranilast. Thus resveratrol may be a potential candidate for alternative treatment of allergic inflamemation. We would like to thank Victor Karpov, Mark Rowsell, Aleksandra Dimitrijevic and Sara Stredulinsky for their technical assistance. This work was supported by a grant from Merck to Marianna Kulka and the National Research Council and the Innovation PEI graduate fellowship (P Pundir). Small-Howard, A.L., Shimoda, L.M., Adra, C.N. and Turner, H. (2005) Anti-inflammatory potential of CB1- mediated cAMP elevation in mast cells. The Biochemical Journal, 388, 465-473.